This affair is a huge scandal which involves the incumbent president of the European Council and his son. How was it possible that a politician who is now so eager to supervise the rule of law in Poland, when he was Poland’s prime minister ignored information given to him by the Chief of the Internal Security Agency and the President of the National Bank of Poland that he and his son were involved in a Ponzi scheme called Amber Gold? Donald Tusk’s claims not to have been warned by General Krzysztof Bondaryk of the ISA appear to be a mere defensive strategy of the former Polish prime minister and the current president of the European Commission, while his attacks on the Warsaw government are not an attempt at enforcing democracy and the rule of law in Poland but rather serve the purpose of toppling the present government, which set up the Inquiry Committee on the Amber Gold. Poland’s erstwhile prime minister and currently the president of the European Council is still the spiritual leader of the present day political opposition in his own country and is doing his best to gain much respect in Brussels. 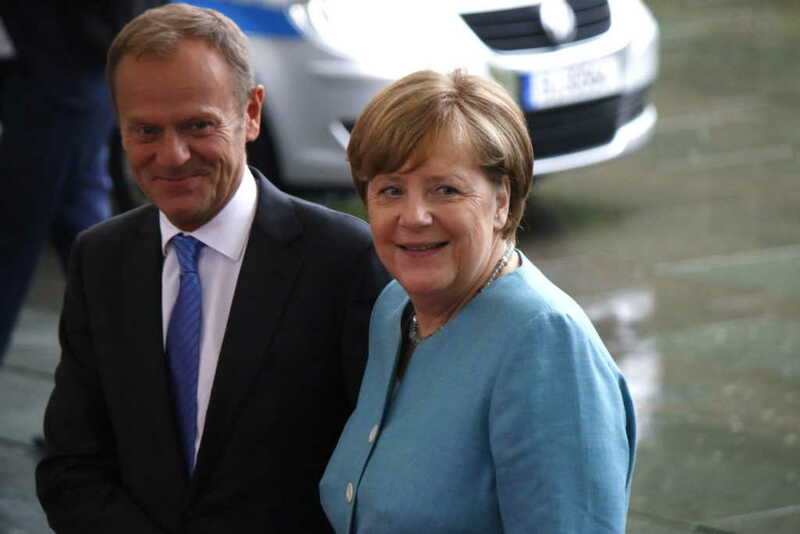 In Poland he was perceived as the one who danced in attendance on the German chancellor Angela Merkel, an assumption which seems to be confirmed by the fact that he was promoted so high in the EU structures. 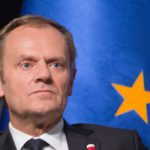 The Western European is likely to believe that Donald Tusk has been assigned this high-ranking post in recognition on the part of the EU of his contribution to establishing the rule of law in Poland, and probably does not know that his Civic Platform party experienced a resounding defeat in the parliamentary election just a few months after Donald Tusk’s transfer to Brussels. The question that arises is whether the promotion of the Polish prime minister was not a helping hand extended to him by Angela Merkel, who both rewarded him for his compliance and, at the same time, saved him from the verdict of the voters as well as that of the court of law (see below). Currently Donald Tusk is taking steps aimed against his own country, but is he doing it out of concern for the alleged lack of democracy and the rule of law in Poland or rather as an act of retaliation for the fact that his party lost power, and that the new government has set up a committee whose task it is to investigate his participation in the largest fraud in recent years? As he was bringing this political pressure to bear on the Polish authorities exactly at the time when the government’s opponents were holding protests in Warsaw, Donald Tusk for all practical purposes was supporting an attempt at a coup d’etat and did his best to create bad press in the West for his own country. Then again, he used threats against Poland for not agreeing to accept the immigrant quota from Syria,3) and lately he warned against voting into law the act on the supreme court.4) Each of the mentioned events the western media covered was done in a biased way against the Warsaw government, creating an impression that Poland was undergoing unfavourable changes. The diagram does not show the subordination of particular entities but merely the relationships that exist between them. 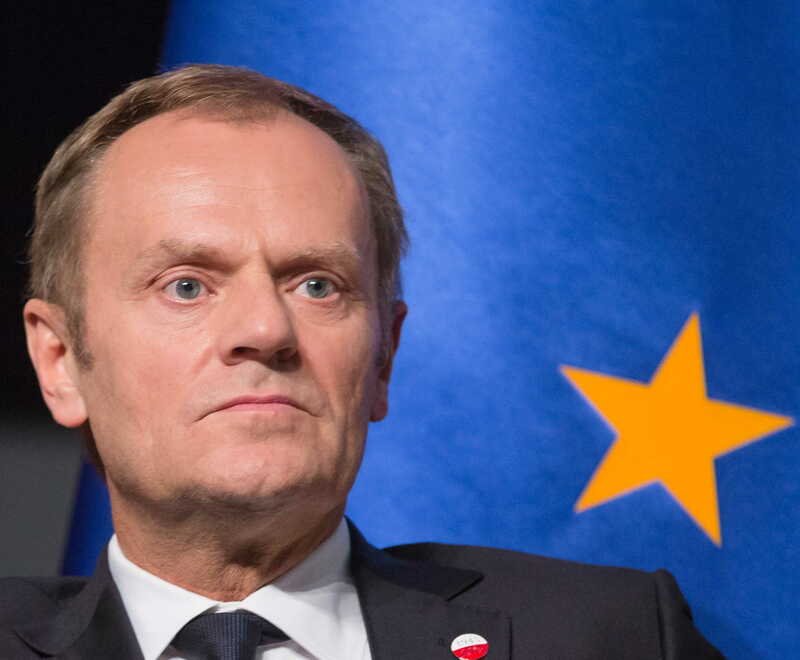 Consider the question again: is Donald Tusk so disapproving of the Polish government because he cares about democracy and the rule of law allegedly violated by Warsaw, or is he driven by other motivations? The transcripts from the hearings of Amber Gold’s president, now the accused Marcin P., shed some light on it. 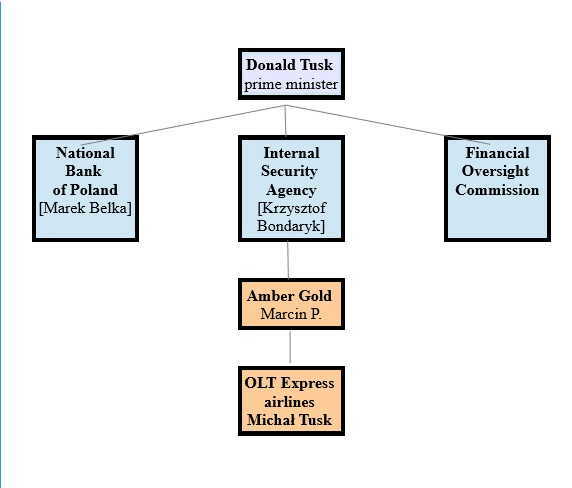 It turns out that the Amber Gold company (the owner of OLT Express for all practical purposes) regarded Michał Tusk’s employment as a kind of protective umbrella and it is hard to imagine that the then prime minister Donald Tusk was not aware of it,9) all the more so since on several occasions he was warned that Amber Gold was a Ponzi scheme by the highest ranking civil servants like Marek Belka, president of the National Bank of Poland10) or in 2012 by Krzysztof Bondaryk, chief of the Internal Security Agency.11)The prime minister did not react. Was it because OLT Express owned by Amber Gold employed his son Michał? Marcin P. admitted the following: “I employ the prime minister’s son. As long as he works for us, I think we are untouchable”,12) and Michał Tusk testified that “together with my father, we knew that the whole enterprise [Amber Gold] was, to put it bluntly, a sham”. Top members of Donald Tusk’s Civic Platform Party maintained suspicious contacts with the president of Amber Gold. The ad below, shot in 2011, shows Paweł Adamowicz, mayor of Gdańsk, together with the local authorities and other Civic Platform politicians, draw an OLT Express plane along the runway of the Lech Wałęsa Gdańsk Airport. Marcin P. appears to have been used as a front man and now is being used as a scapegoat, so the Inquiry Committee seeks to uncover the masterminds behind that fraud. Whether the Committee will manage to unmask them or not remains to be seen. 1. ↑ Tusk: nie czuję się odpowiedzialny za starcie z polskim rządem, TVP INFO 2017-03-08. 2. ↑ Tusk: trzeba liczyć się z poważnymi konsekwencjami, koduj24.pl 2017-01-11. 3. ↑ I wszystko jasne: Tusk też grozi Polsce. Straszy konsekwencjami, bo nie chcemy przyjąć uchodźców, niezależna.pl 2017-05-17. 4. ↑ Donald Tusk po przyjęciu ustawy o SN: Polsce grozi marginalizacja na arenie międzynarodowej, wyborczapl 2017-07-20. 5, 7. ↑ Amber Gold, Wikipedia. 6. ↑ Amber Gold, Wikipedia; Komisja ds. Amber Gold: syn Tuska był politycznym parawanem, TVP INFO 2017-06-23. 8. ↑ Była wiedza u najważniejszych osób w państwie o tym, że ta piramida jest, TVN24 2017-06-22. 9. ↑ Maciarewicz: Donald Tusk rozpiął parasol ochronny nad Amber Gold, Do rzeczy 2017-06-25. 10. ↑ Powiedziałem, że to piramida finansowa. Belka ostrzegł Tuska przed Amber Gold?, TVN24 2014-06-16. 11. ↑ „wSieci”publikuje notatkę ABW w sprawie Amber Gold. Mieli dostać Tusk i Komorowski, TVN 24 2017-07-03. 12. ↑ Dopóki Michał Tusk u nas pracował, nikt nas nie ruszył. Ujawniono stenogramy rozmów Marcina P. Do rzeczy 2017-06-25. 13. ↑ Paweł Adamowicz o zarzutach Antoniego Macierewicza, WPwiadomości 2012-08-31. 14. ↑ Marcin P. sypie. Kopacz i Adamowicz na liście osób z lokatami w Amber Gold?, niezlezna.pl 2017-06-28. 15. ↑ Afera Amber Gold. Prokuratura Barbara Kijanko w czerwcu nie przejdzie w stan spoczynku, inferiafakty 2017-02-23. 16. ↑ Antoni Macierewicz: od dawna były hipotezy, że D. Tusk rozpiął parasol ochronny nad Amber Gold, tysol.pl 2017-06-26. 17. ↑ Co zeznał szef Amber Gold ? Kilka cytatów Marcina P…, niezleżna.pl 2017-06-28. Attack Against Nord Stream 2 Renewed with Vigor: Whose Interests Does It Serve? Why has this not been widely publicised to show the public what a corrupt parasite he is and, why is he still ok in his position ?